The Anza – A Calabasas Hotel, is just a short drive from the excitement of Los Angeles, Hollywood and Malibu, and is within walking distance of many of Calabasas’s most popular attractions. Get to know Calabasas and the San Fernando Valley, while enjoying the comfort and convenience of The Anza. (one block away) – Big kids and little kids alike will enjoy a walk through history at the Leonis Adobe Museum and ranch. The ranch is one of the most historical sites in the San Fernando Valley. Visitors can walk through the 100-year-old barn, historic Plummer House, and see the live ranch animals up close. With advanced notice, the ranch is a great place for a group of kids to learn the history of Southern California or to have a photo shoot back in time. Staff Favorite Restaurants – The Six Chow House, Sagebrush Cantina, and Pedeler’s Fork give guests at The Anza an excellent variety of options when looking for a bite in the neighborhood. Every Saturday morning, the parking lot behind Pedeler's Fork is alive with fresh meat, dairy, produce, flowers and crafts that the local artisan farmers have brought in to sell. There are several food tents featuring breakfast and lunch menus as well. Feeling Frisky? Stay in shape on the road at Fit Core Personal Training and Yoga Studio up the street. 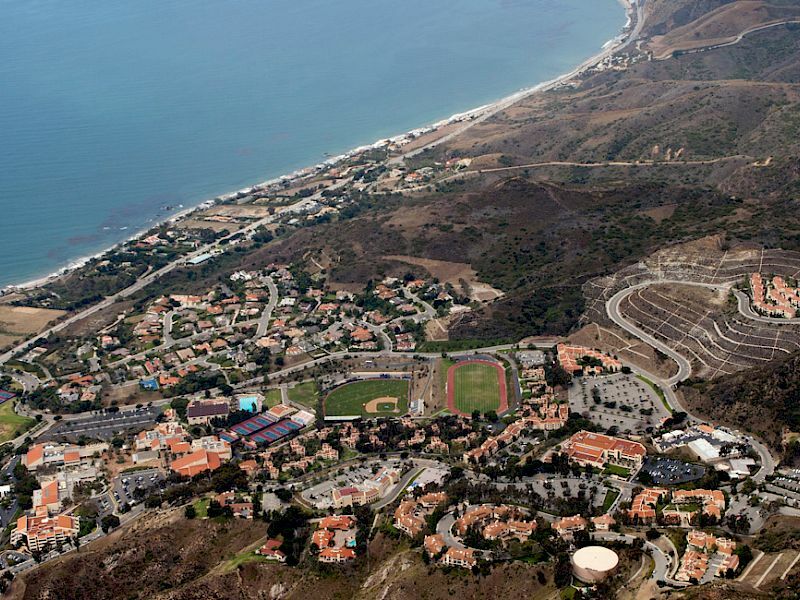 The Anza is only 13 miles from Pepperdine University making it the perfect hub for friends and family visiting the campus. Stay in scenic Calabasas in the best hotel near Pepperdine University. Breeze to and from Pepperdine effortlessly while staying in the serene ambiance of Calabasas. Enjoy Waves sports and other Pepperdine competitions and events without paying the high Malibu hotel rates. If you have adventure on your mind then The Anza has you covered. Hiking, biking, rock climbing, fishing, bird watching and more, are all within a short drive from The Anza. Spend a day exploring the iconic Malibu Creek State Park or Topanga Canyon, and the evening relaxing in the spacious and comfortable accommodations of The Anza. Planning a scenic excursion up north to Monterey, San Francisco or beyond? Located off Hwy. 101, The Anza – A Calabasas Hotel, is the perfect place for a quick pause and rest before continuing on your road trip. Enjoy a delicious meal, take a soothing dip in our outdoor pool and gear up for a day on the road with a rejuvenating night’s sleep in one of our spacious guest rooms.